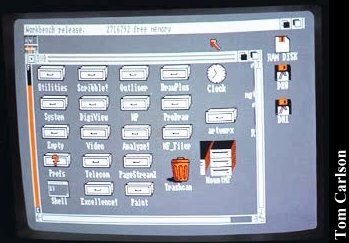 The Amiga utilized both a graphical interface, and a command line. (A little like having an xterm window open in X Windows.) You could perform most tasks from the graphical interface, but the command line was available to those who liked it. The startup scripts on most Amigas I've seen set up a small command line window at the bottom of the screen. It combined the best of both worlds. Plus you got long filenames. The low resolution modes (320 x whatever) were good if you had to use a TV as your display device. The high resolution modes worked great with the Amiga monitor. The interlaced modes tended to flicker quite a bit, but that's the price you pay. You could buy additional hardware that would eliminate the flicker. You also had numerous color depths. You could have anywhere from 2 to 16 colors (from a palette of 4096) in any of the resolutions. In the low resolution modes, your could also have 32 colors. Additionally, there were two special modes available in low resolution modes. One was called Half-Brite mode. It gave you 64 colors, with a catch. You got to pick 32 colors, and 32 more were created that were half as bright as the 32 you chose. It sounds weird, but was great for games with drop shadows. The other special mode was called Hold And Modify, or HAM for short. HAM mode let you have all 4096 colors on the screen at once. It performed this trick by creating a 16 color palette. A pixel could be one of those 16 colors, or it could copy two color values from the pixel to its left and define the third color. For example, a pixel could copy the red and green values from its neighbor to the left, and define its own blue value. This let you have all 4096 colors, but limited which colors could be next to each other. Plus, changing one pixel could potentially change the color of every pixel to the right of it. Despite these limitations, HAM mode screen could be gorgeous, for beyond what either IBM or Mac machines could do. 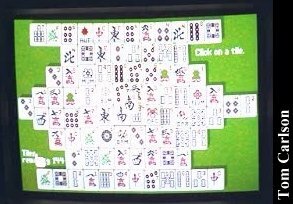 HAM mode was used mainly for still screens, but a few games actually utilized it. 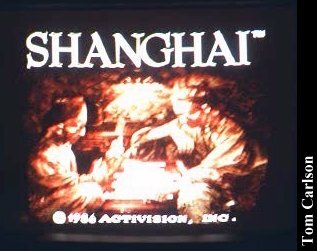 The Amiga also had other graphics features. 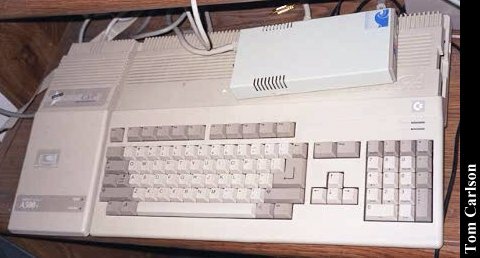 A stock Amiga 500 could output an RGB signal, or a monochrome composite video signal. The 520 adapter allowed it to also output color composite video and even an RF signal. The AmiGen genlock would let you superimpose computer graphics over a live video signal. The video feed would replace the background color on the screen. This lets you add titles to video and do a host of other neat things. 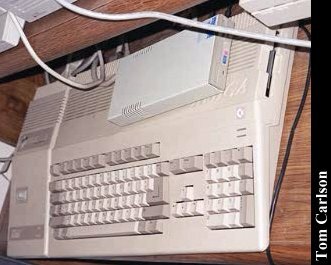 The Amiga also had great sound capabilities. It used digital sound, through 4 separate channels. (Does your Sound Blaster have 4 separate digital channels? I didn't think so.) The sound was pumped through two audio outputs, with 2 channels assigned to each one. This let the Amiga produce true stereo sound. Digitizers, like Perfect Sound, let you record your own samples. Perfect Sound had dual inputs, which let you directly record in stereo. Amiga hard drives just plugged into the side of the machine. Some had a switch on top that let you easily switch between booting from the hard drive and booting from floppy. The Amiga OS let you do a sort of symbolic link that would allow you to run software designed for floppies off the hard drive. Amigas could also read 3½" IBM floppies and high density Mac floppies. Memory expansion took the form of a wedge shaped unit that fit into a cavity on the underside. Software is still being written for the Amiga. The best source for Amiga software is at Aminet. Amigas are capable of surfing the net, and since they can read other systems' disks, it's not that hard to get them set up for it. 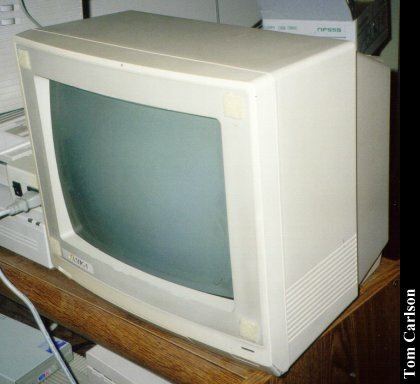 Click here to view all comments for the Commodore Amiga 500 and to leave your own.